A few years ago we tried to make bath bombs and let’s just say they were one of my more epic DIY fails. We had fun, but they didn’t work the way Martha said they would. The problem was you had to add water to them to get them to stick together and the water activated the ingredients before we got to use them in the tub. But, we’ve found a work around…herbal bath fizzy. Just what is herbal bath fizzy? It’s the classic herbal bath tea (or soak) with baking soda and citric acid added to make it fizz in the bathtub. 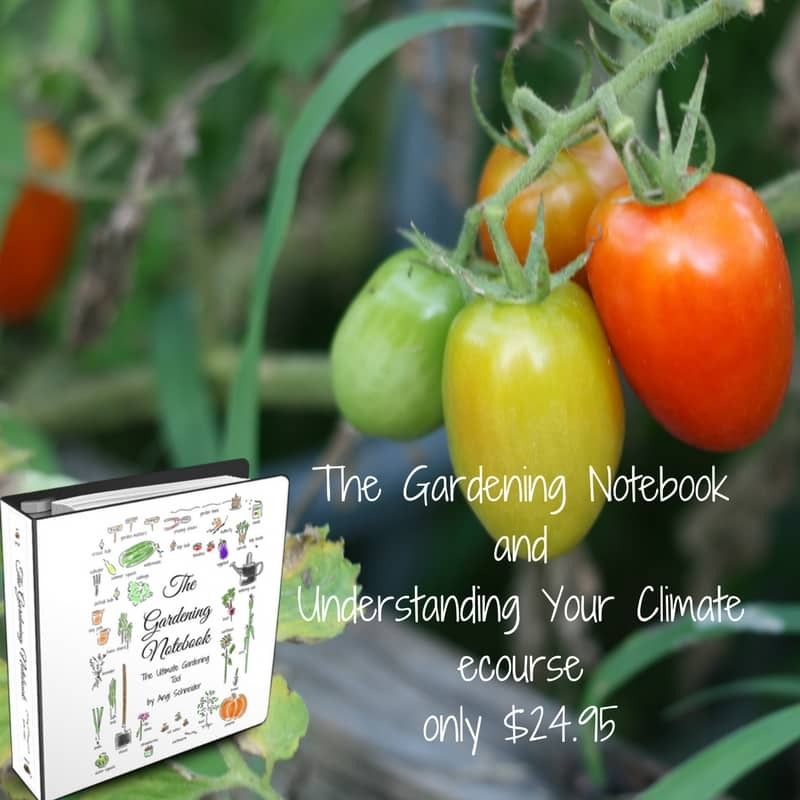 It’s super fun, it actually works and it would make a great gift. 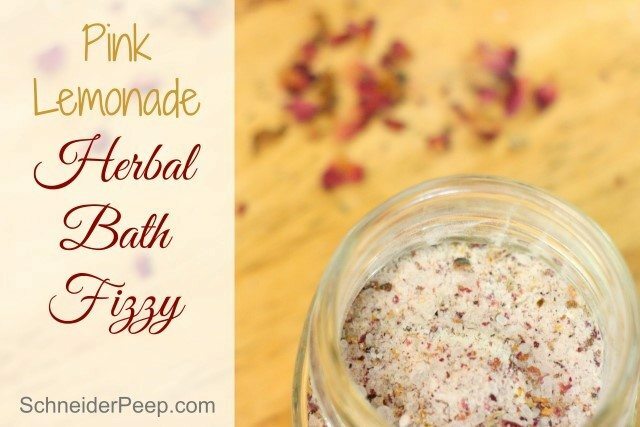 We found a recipe for a pink lemonade herbal bath fizzy in Jan Barry’s new book, 101 Easy Homemade Products for You Skin, Health and Home and knew we needed to give it a try. I’ll write more about the book below, but for now let’s focus on this fun product. Fortunately, I had all the things needed to make the herbal bath fizzy on hand. I did make one substitution, Jan recommends using course seas salt and a bit of pink Himalayan salt. I just used epsom salt. If I were making this for medicinal reasons, I’d use the Himalayan salt since it has more minerals in it, but we’re just making it for fun and so epsom salt will do just fine. The recipe uses dehydrated lemon peel, lemon season is pretty much upon us so make sure you zest those lemons and dehydrate the zest. We grow lemons so I try to zest enough during lemon season to last for the year. It also uses dried roses. I don’t grow roses so I have to order dehydrated roses. 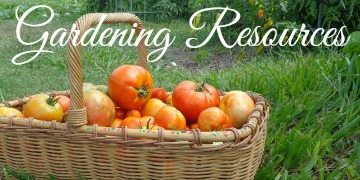 They’re pretty inexpensive so it’s okay, but I should really plant a few rose bushes next spring. 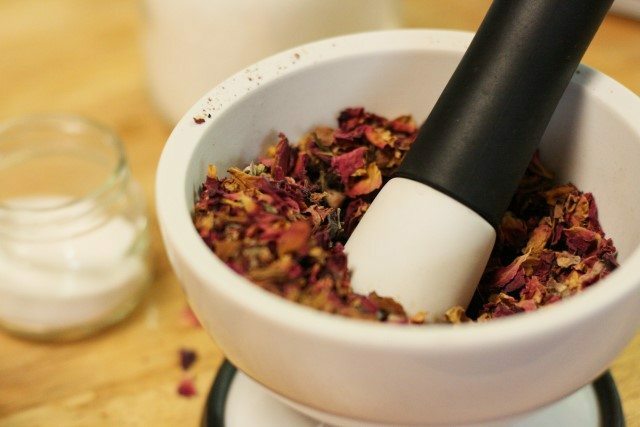 You can use a mortar and pestle to crush the lemon peel and the roses, however if you want them really fine, you can give them a whirl in a coffee grinder. We keep an extra one on hand just for herbs. 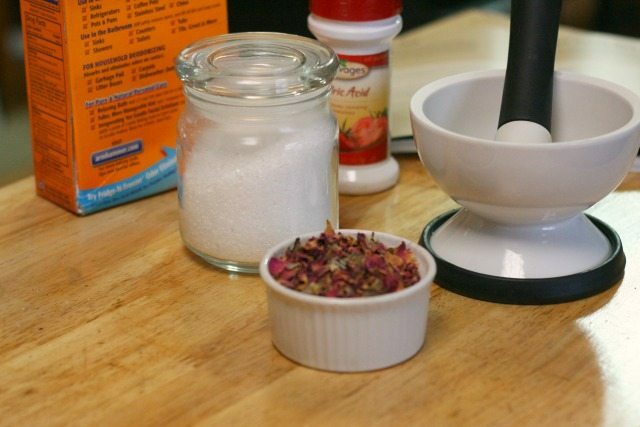 Grind the rose petals and lemon peels with a mortar and pestle or in a coffee grinder. Pu the ground herbs into a bowl and add epsom salt, baking soda and citric acid. Mix well. Store in sealed jar. To use, pour 1/4 cup into warm bath water. Water will activate the reaction between the baking soda and the citric acid so it’s important to keep moisture out of the jar. If you live in a humid area or or storing this in the bathroom, just make one batch at a time and remember to put the lid on after each use. Please note that citric acid can be hard on sensitive skin, so use with caution on small children and those with sensitive skin. If you are making this ahead of time to give as a gift, you might consider vacuum sealing them in canning jars with a food saver. I received a copy of this book several months ago to review. Shortly after that we spent a weekend at the beach and I took this and another book along for reading. I didn’t touch the other book that weekend. I just kept reading and looking and making notes from this one. I kept telling the girls, “Oh, look at this. Wouldn’t this be fun to make?” And they kept agreeing. Since then we’ve tried several recipes, the dry shampoo and the bath melts for example, and all have been easy to make. I don’t know about you but I like easy. 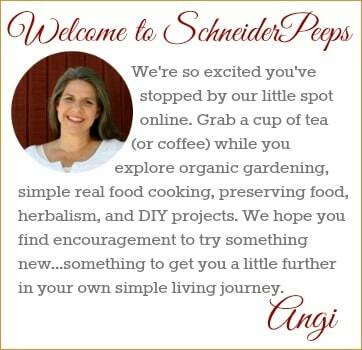 Most of the recipes use ingredients I have in my kitchen, garden or apothecary. Many times recipes like this are heavy on using essential oils, these recipes use whole herbs. Some do use a bit of essential oils, but that isn’t the focus. I really like this because I can easily grow many herbs but I can’t easily extract essential oils from them. But the book isn’t just a collection of great recipes. In the beginning of the book, Jan gives information for every ingredient she uses in the recipes. It’s quite impressive and I believe it will help you make good substitutions for your family. In 101 Easy Homemade Products for Your Skin, Health and Home, you’ll also learn how to make soap, cleaning products, infused oils and vinegars. I’ve always been kind of scared of making soap, thinking I needed a hazmat suit and all, but after reading the soap section in this book I feel like it’s doable without the suit. I really tried to find something negative to say about this book because I always want to give an honest review, but I cannot think of anything I didn’t like. There are beautiful photos of almost every recipe, the book is well laid out, the recipes live up to the books title in being easy and the book lays flat (something I really appreciate in recipe books). Our local library carries this book and your’s might too, so be sure to look there first and try out a few recipes before you buy it. 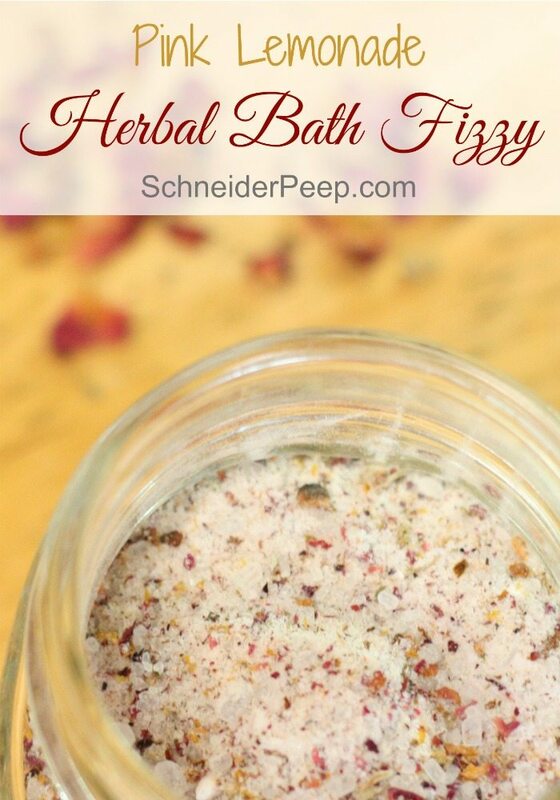 Have you ever made an herbal bath fizzy?